The Battle on the Ice was fought between the Russian Army led by prince Alexander Nevsky and the crusaders of the Livonian branch of the Teutonic Knights on April 5, 1242 at Lake Peipus. Since 1237 the Teutonic Knights started conquering the Russian lands. The Teutonic Knights attacked the neighboring Novgorod Republic and occupied Izborsk in summer 1240. Their next target was Pskov, which withstood a week-long siege. Russian churches, neighboring villages and trading quarter were razed and burnt down. In winter 1240–1241, the enemy captured Sabel, Tesov and Koporye, where the invaders set their garrison. The threat of Novgorod being invaded and ravaged was looming. Koporye, Vodskaya Pyatina and Pskov were taken back in 1241. The prince decided to meet the enemy and fight it at Lake Peipus (Lake Chudskoe) near the Vorony Kamen Island on April 5, 1242. The Battle on the Ice had a tremendous historic significance — the northern boundaries of the Russian state were secured, which eliminated a threat of the enemy capturing them for a long time. 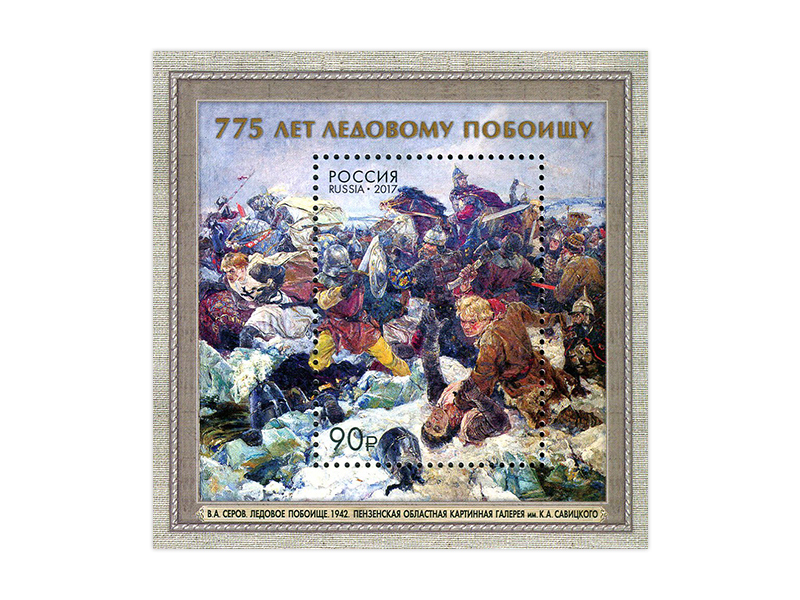 The souvenir sheet features a painting The Battle on the Ice by Valentin Serov (1942).